Possibly the best Italian meal I’ve ever had? 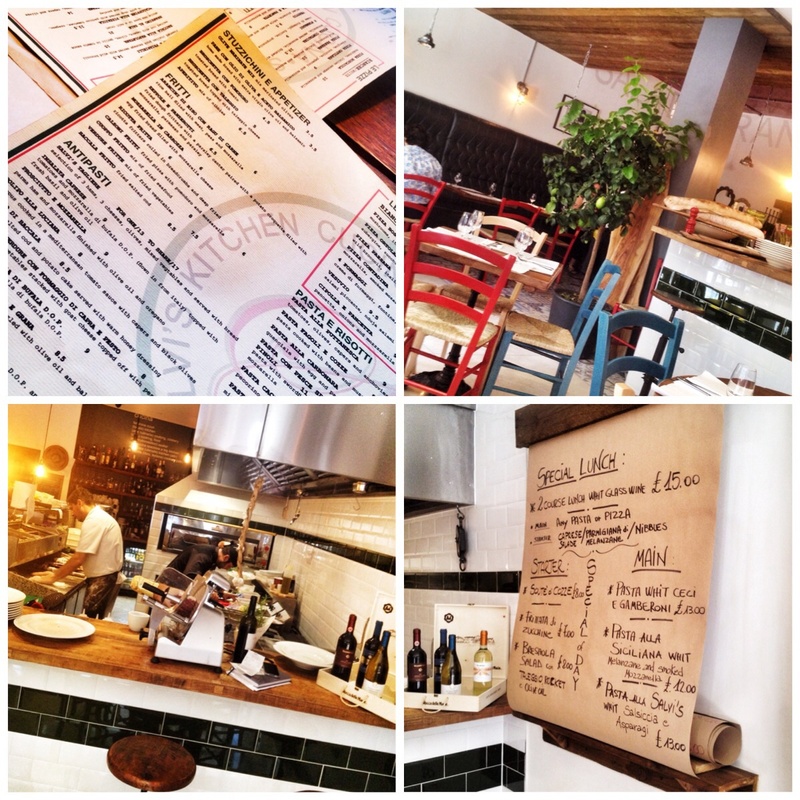 Salvis Cucina (kitchen in Italian) is a new, rather understated eatery that has sprung up in the nondescript concrete avenue of John Dalton Street in Manchester. I sportingly took The Flame there as recompense for a forthcoming road trip with a couple of gentlemen friends to watch a bunch of rock debutants in North London outpost Enfield. Salvis sprang forth in the mind as one or two local work pals have raved over their pre existing ‘Mozzarella Bar’ down the other end of town in the ill fated Corn Exchange Triangle. 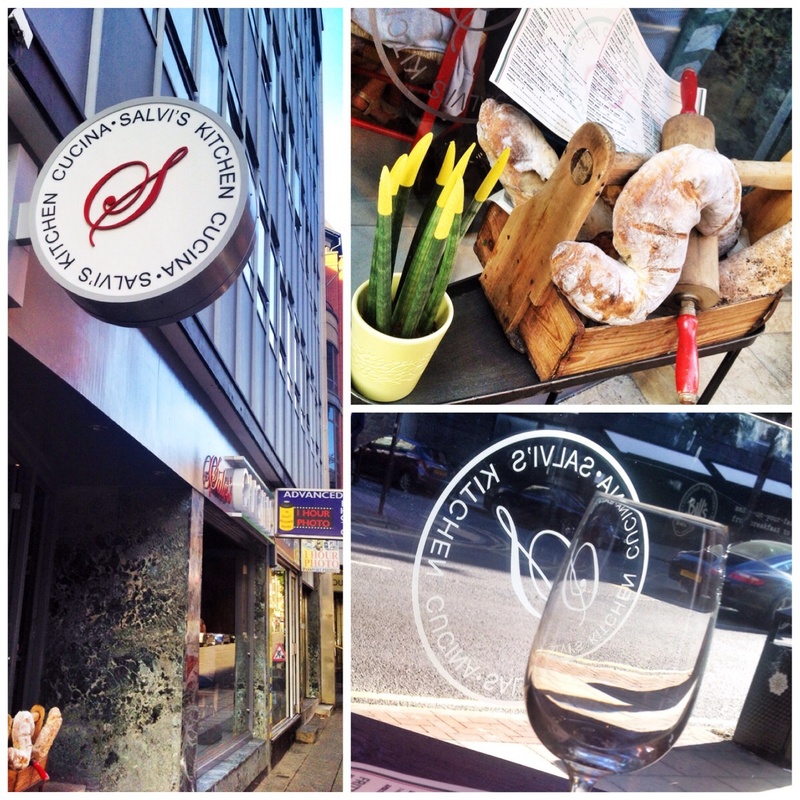 Salvis are an Italian dynasty that has purveyed quality Italian ingredients in Manchester for a few years now. And after our meal I wholeheartedly suggest they continue. Decor is rather modest, the odd flash of colour from a strategically placed painted chair. The open kitchen dominates, the hardworking chefs plunder their skills amongst a plethora of shaving, slicing and turning machinery. It’s a pleasing sight. Our table was preordained after I had ventured in earlier in the day. Our table was set right up against the semi height glass frontage. As this was a sunny eve our table was streaked with fresh sunlight and fresh(ish) Manchester air. It was wonderful. Our delightful Italian waitress plied us with water and wine and took our order after explaining the specials in the most delicate Italianate English. To further help the specials are scrawled on a large brown paper roll. Nice touch. Our antipasti soon homed into view. Mine first, ‘Cappachio Di Nanzo Rucola E Grana’ (beef, rocket, Parmesan, drizzled with olive oil, balsamic and lemon £8.50). It was wonderful, ‘waffer’ thin slices of raw beef with a cheesy, oily, herby coat. 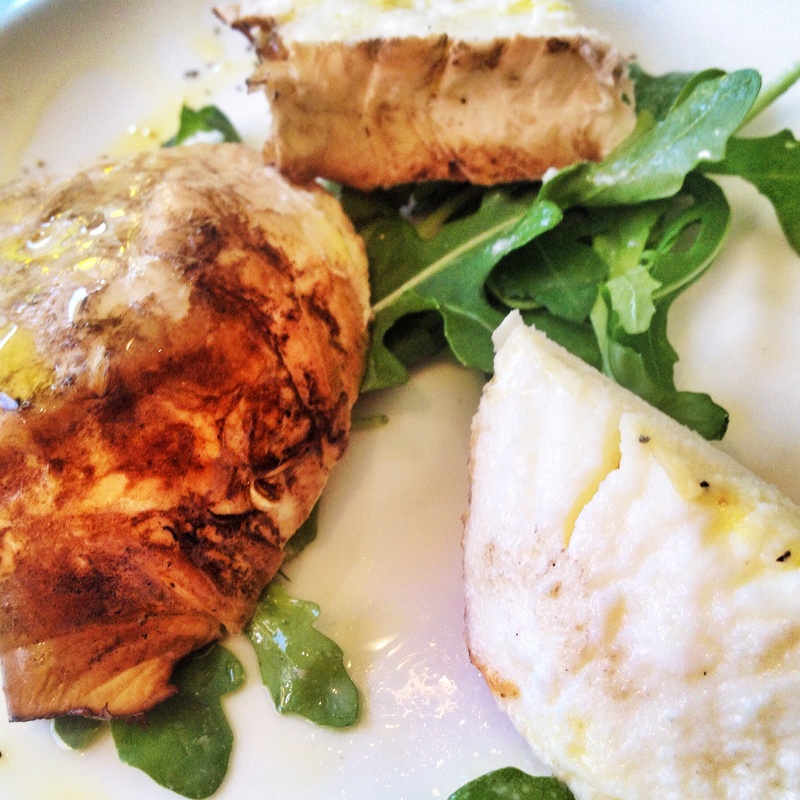 As a treat I did ask if I could try some smoked mozzarella as I was intrigued. Rather than the slither I anticipated I was graced with a fully dressed ball in a separate bowl. It was a bit too much to eat in one lump but I loved the smokey rind, definitely one to bear in mind. The flames starter was a bit of a strange one. Entitled ‘Timbalo Di Venture Con formaggio Di Capra E Pesto’ it was subtitled as mixed grilled vegetables stacked with goats cheese and topped with pesto (£8). 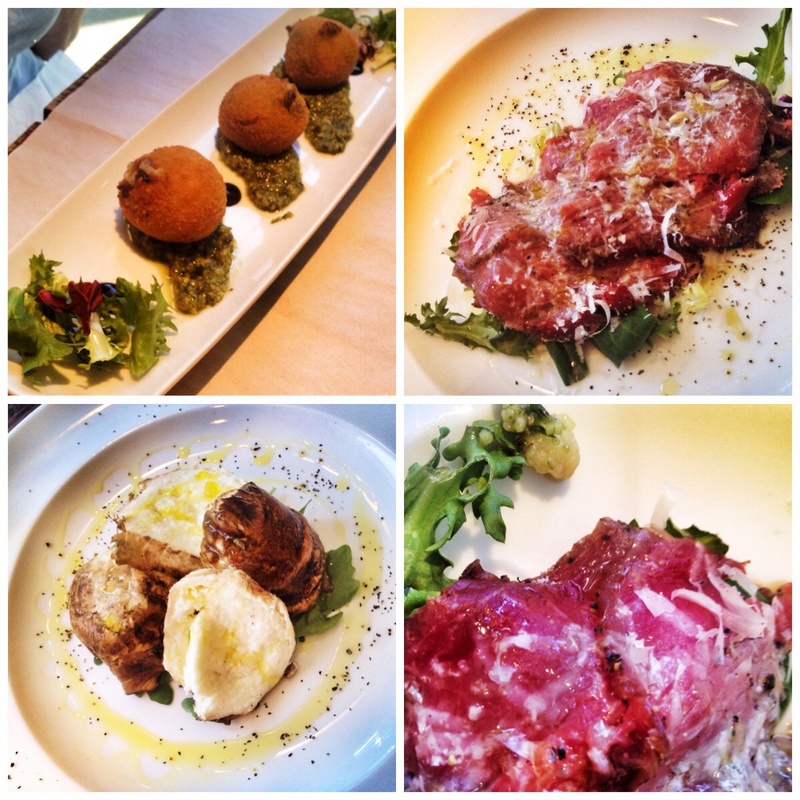 It turned out to be three deep fried orbs set on a base of dressed leaves and a super homemade pesto. It wasn’t what was expected but it was still delicious and was gleefully mopped up. The grilled veg were merely slithers mixed in with the cheese and deep fried. 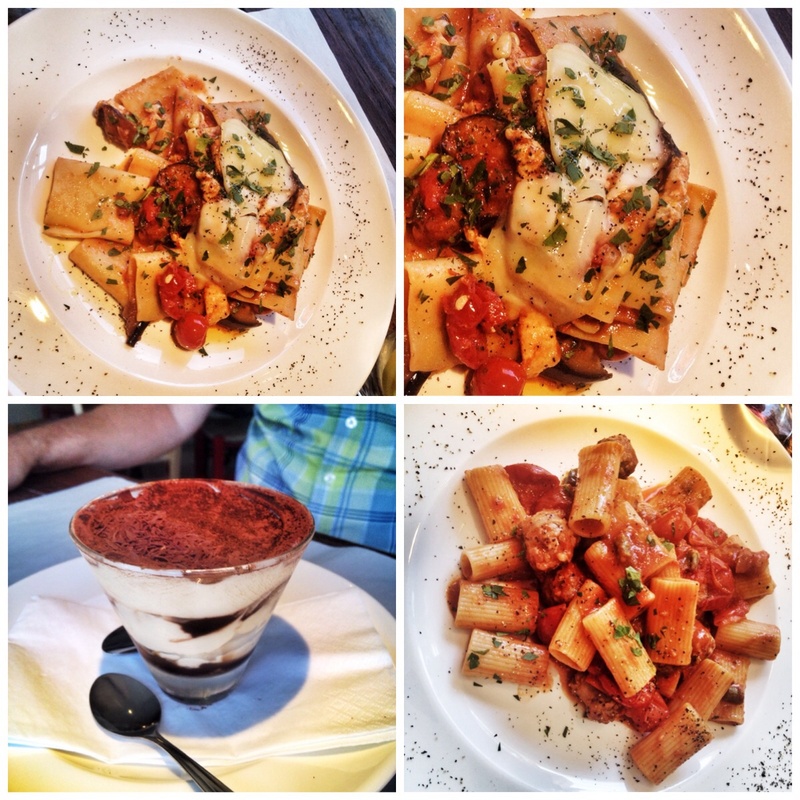 We both went for simple pasta dishes for mains but even these were a step above the norm. Mind you I could argue they should have been at £11.50 and £13 a plate. It isn’t cheap, but ye gods they were both sensational. The flames ‘Pasta Con Pesche Spada, Melenzane, Scamorza E Pinoli’ (swordfish, aubergine, pine nuts and smoked mozzarella) probably shaded it. The pasta itself beautifully cooked and seasoned. The tastes and textures sublime. I had a pasta off the specials board. ‘Pasta alla Salvis Whit Salsiccia et asparigi’ (sausage and asparagus). Finished in a tomato sauce (or ‘sowse’ as our waitress called it) it was still a simple pasta dish but somehow it just tasted so much better than most I’ve ever had before. I can’t really explain why but it was. You’ll just have to try yourself! I as usual I rounded off with a desert for research purposes. I run a personal competition to find a tiramisu to match my childhood version as provided by Culcheth heroes ‘Don Luighi’. I think I have found a joint top version. It seemed a bit too thick at first but deep down the ‘V’ shaped flask the moist, boozy, creamy loveliness came bounding through. A triumph at any price but at £4.50 it had no equal. Whilst us chaps all know brownie points have ceased to be legal tender in most relationships there is no doubt Salvis worked its magic on The flame. The Gentlemans weekend continued without a hitch and there is no question we will be back. Going forward I can see this being one of our favourite staple restaurants. Highly recommended.